Fuel Cell Electric Vehicle Station Sign - With or Without Directional Arrow - 18x18 - Reflective Rust-Free Heavy Gauge Aluminum Parking Signs with Anti-weather and Anti-graffiti Protection Available. The California Energy Commission has a goal of constructing at least 100 hydrogen stations across the state by 2020. 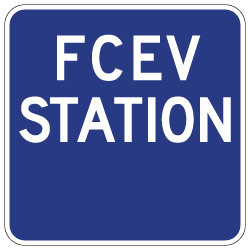 With approximately 3,000 Fuel Cell Electric Vehicles driving on California's roadways, the demand for appropriate FCEV signage has steadily increased to try and help guide motorists to nearby fuel stations. STOP Signs and More has taken the initiative to develop Fuel Cell Electric Vehicle Station Signage with directional arrows to help alleviate the frustration motorists feel when needing to locate a nearby FCEV Station.